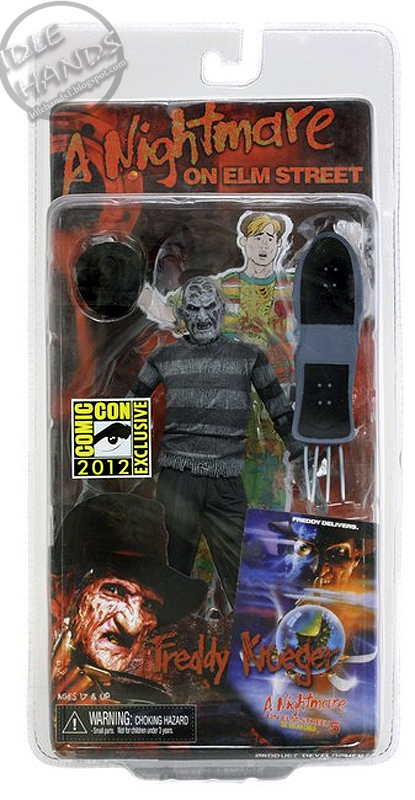 Just when you thought Freddy Krueger NECA figures couldn't get any cooler, NECA will have this at their table this week at San Diego Comic Con; a black &amp; white Freddy from "A Nightmare On Elm Street Part 5: The Dream Child". Standing in a 7" tall, the figure comes with a the trademark fedora, the skateboard with the glove blades, &amp; probably the coolest accessory of all...&amp; Mark Gray standee in comic form with slices taken out of him. Definitely pick this one up when you can. The pictures definitely make it out to be one of the best Elm Street figures to date.